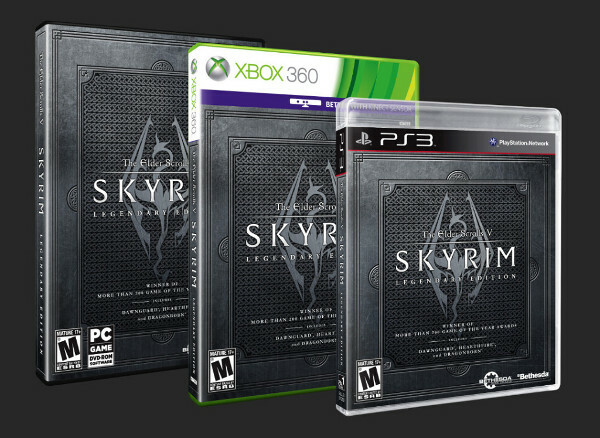 Elder Scrolls V: Skyrim is coming back to stores in a new Legendary Edition bundle. Bethesda confirmed that the bundle, billed as the "complete Skyrim collection," will be arriving on the PS3, Xbox 360 and PC in June. The Skyrim Legendary Edition includes the three DLC packs for the game. Dragonborn introduces the island of Solstheim for players to explore. Dawnguard is a new questline involving a society of vampires who want to blot out the sun and take over Tamriel. Hearthfire, the smallest of the three, allows players to build their own customizable home. The copy of Skyrim in the Legendary Edition has been updated with all of the post-release patches. This includes a very long list of bug fixes. New features added by patches since the game's November 2011 launch include mounted combat and legendary skills. The Legendary Edition will be priced at $59.99 on all platforms. The bundle will hit North American stores on June 4th. Europe will receive it on June 7th. Bethesda announced earlier this month that they had finished producing new content for Skyrim. They intend to still support the game with small updates as needed, though.